Having read Lost Boy by Christina Henry and absolutely loving the re-telling aspect, I knew I had to request The Mermaid. Especially since I love all things mermaid. In many ways, this is a Little Mermaid retelling, meets PT. Barnum, meets some fabulous themes about love and agency. While I came for the mermaids, the themes ended up keeping me intrigued. Any story that deals with the exploration of belief and agency will hook me. This is more than a love story, more than a re-telling, it unfolds into something else – this hybrid story that may just find its home in your beach bag. The Mermaid is one of those books where the themes hooked me. The Mermaid functions on this idea of belief. People want to believe, to escape, to get away from the reality they despite and to cling to something else. Barnum capitalizes on this in this intricate dance. In some ways, you want to be deceived, you want to believe, but you know the likelihood is low. But what I loved about Henry’s personal touches is that Henry brings in the authentic. It’s not just a question of the con, but what happens when you stumble upon the real thing. Where is the real line between the real and the unreal? The true and the belief? Amelia probes at all the cracks and space in-between the two. I instantly connected to Amelia. I could feel her feelings of being out of place. You can connect to the ways she pinpoints some of the absurdities of the world. For a while, I was scared for her to meet Barnum, who so blatantly and overtly capitalizes on this line of belief. But I shouldn’t have been. Henry delivers a cast of intriguing characters, Amelia and Barnum’s wife, Charity, among them. Amelia learns to fend for herself because she is strong. She is strong enough to swim the sea, to fall in love, and to move on afterwards. At the same time, Charity is the character who surprised me. Charity’s development illustrates Henry’s skill in playing out themes on an almost global scale in the book. Henry offers some commentary on femininity, especially the boundaries that is imposed by society (ie. the clothes, the false modesty, the coyness). And this brings up the next of the themes I loved about The Mermaid – agency. Henry’s various characters explore the cages we are trapped in, cages made of delusions, and the cages we swim into. Each of the characters handles these limitations differently. And strangely enough, here is where I felt a bit more empathy towards Barnum. His possessiveness and desires place him into a cage of expectations thinking the world runs the way he thinks it does, that people can be bought, and belief sold. At the same time, both Charity and Amelia talk about the cages we form by love – the way we can be persuaded, and the ways we are bound by the very people we love. Another theme I loved, but won’t go into too much, is how Henry probes at the lines drawn about humanity. Henry looks at who deserves to be treated like an animal. The Mermaid talks about the way Barnum treats his curiosities, but also the relationships in his life. At the same time, Henry talks about both the animosity in humanity and the generosity in animals. 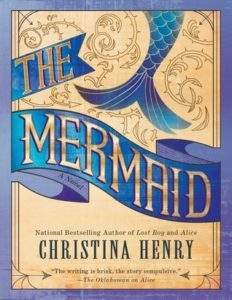 If any of these elements – the characters or the themes – interest you, make sure to check out The Mermaid on Goodreads. What re-tellings do you like? I just finished this last night, and I agree, Henry really digs deep into several themes, which is one reason I love her stories so much. This was a much tamer story than her other books, but I really loved it, even though I sort of missed the darker tones. Oh yeah, I wanted more darkness too! But you’re right, I really liked lost boy too! great review!! i kept seeing the book on goodreads and was already kind of into it because MERMAIDS but wow im so glad to know there’s actually even more to the story than just the magical elements!! Yes! It’s way more, it’s like re-telling meets history!